The same principles apply to renovations - We help plan and we manage the project but there is no mark up on contractors or materials and you get what you want. Your basement can be an important part of your home and provide extra living space for your family. For many homes, the basement is a great, unused potential for more space. It can be a cost-effective alternative to adding a new family room, an extra bedroom or a home office. 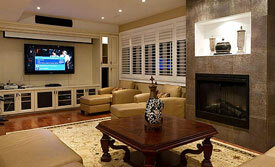 We can help you turn your basement into an attractive, comfortable living space. Or you may you want to upgrade your existing basement - give it a fresh new look. We can design the plan and choose materials. Your bathroom is meant to be your personal "private escape" - a place to pamper, cleanse, and rejuvenate one's body after a good sleep or a hard day's work. But, if your existing bathroom is not like this, it needs a renovation! 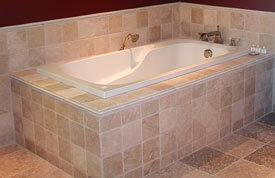 We will help you plan your new bathroom and then make sure it becomes a place that you want to be in. 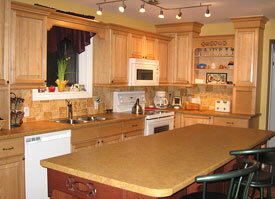 The kitchen is one of the most utilized rooms in the house and should be done right. A well-planned kitchen design can make a huge lifestyle difference. Kitchen renovations can be expensive so attention to cost is important but it is also one of highest investment returns for homeowners. Good planning is important but so is good workmanship. As well as new cabinets and counters, a new kitchen may have new flooring, plumbing, appliances and electrical fittings. We will help with design and making the right choices. We then manage the contractors and make sure you get the kitchen you want.